Margaret Fuller and Ralph Waldo Emerson had a complicated relationship. In her first review in Horace Greeley's New-York Tribune, she writes that Emerson is "undoubtedly the man of ideas, but we want the ideal man also." As Adam-Max Tuchinsky notes, "Fuller's complaint about Emerson has become, in many respects, a familiar one; her fear is that, in his idealism, Emerson had 'raised himself too early to the perpendicular' and cut himself off from the 'conflicts on the lap of mother earth' is now a recognizable refrain in American cultural criticism ...."
Read more about Fuller here. October 12, 1841: “…whom I always admire, most revere when I nearest see, and sometimes love, -- yet whom I freeze, and who freezes me to silence, when we seem to promise to come nearest." She had a wonderful power of inspiring confidence and drawing out of people their last secret. The timorous said, ‘What shall we do? How shall she be received, now that she brings a husband and child home?’ But she had only to open her mouth and a triumphant success awaited her. She would fast enough have disposed of the circumstances and the bystanders…. Tuchinsky, Adam-Max. 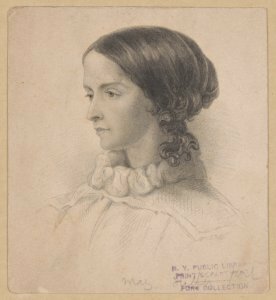 "'Her Cause against Herself': Margaret Fuller, Emersonian Democracy, and the Nineteenth-Century Public Intellectual." American Nineteenth Century History. 5.1 (2004): 66-99. Emerson, Ralph Waldo. The Heart of Emerson's Journals. Ed. Bliss Perry. Boston: Houghton Mifflin, 1926. Print.